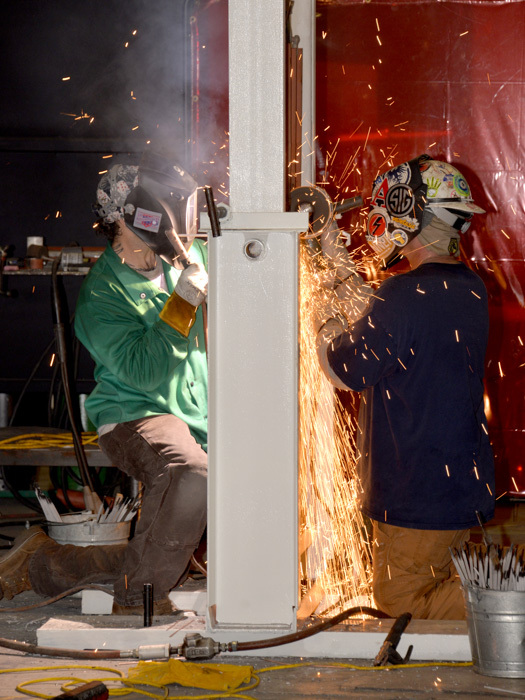 COMPETITORS AT THE NATIONAL APPRENTICESHIP COMPETITION SHOWCASE THEIR SKILLS AT LOCAL 28 IN NEWARK, NEW JERSEY. Pictured from l. to r.: Matt Stillson, L-1; Joshua Slater, L-169; Dwayne Martin, L-40; Michael Estes, L-83; Joshua Roupe, L-154; Andrew Davis, L-29; Justin Williams, L-101; and Jason Eubanks, L-549. Judges for the competition pose with contestants after the awards banquet. During the Western States buddy weld exercise, L-549’s Jason Eubanks, left, welds in a new tube while L-101’s Justin Williams preps the membrane. Justin Williams, L-101, cuts out a pattern of the New Jersey Devils ice hockey team logo using an oxy-acetylene torch. 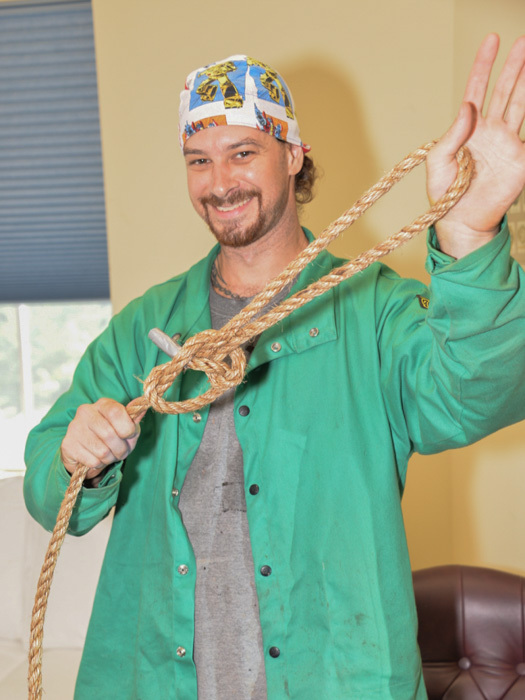 L-549’s Jason Eubanks shows off his knot-tying expertise. 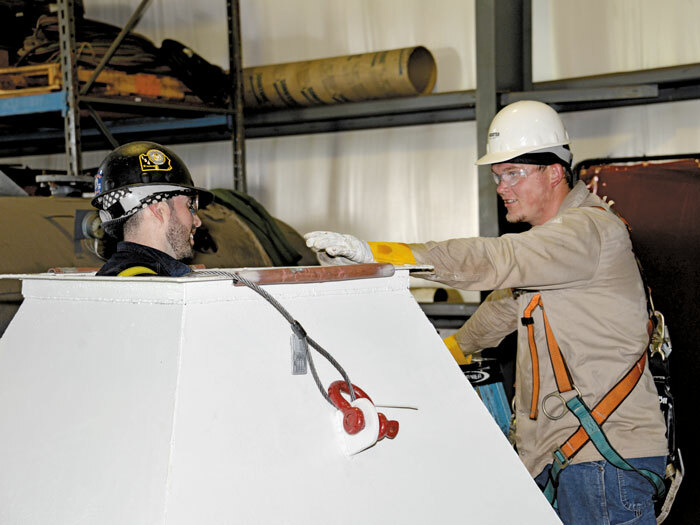 Winning Northeast Team member Andrew Davis, L-29, stands inside the hopper discussing next steps with Joshua Roupe, L-154, during the team rigging exercise. INDIVIDUAL RUNNER-UP Andrew Davis, L-29, measures during layout and fabrication. 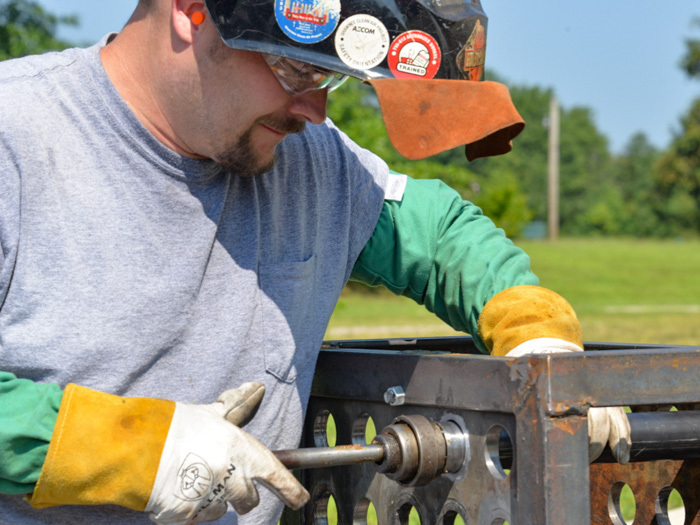 Josh Roupe, L-154, uses arc gouging to remove a flange from a previous project. 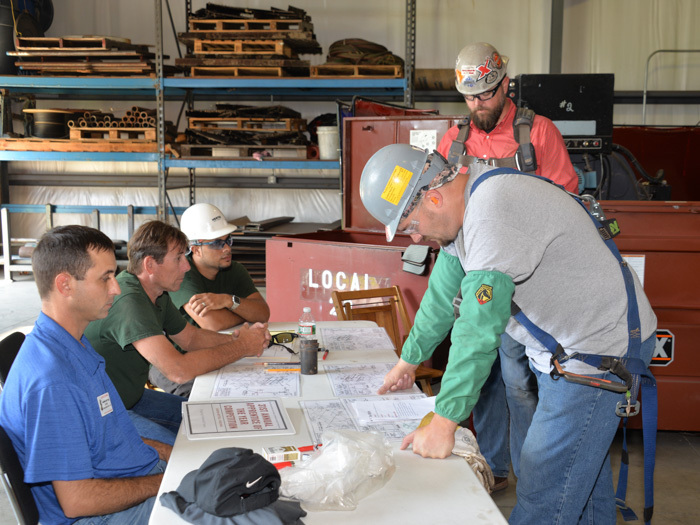 The Southeast team of L-40’s Dwayne Martin, right front, and L-83’s Michael Estes, right back, review instructions for the team rigging exercise. Seated at the judges table are, l. to r. is Jason Hettel, Local 27; Chuck Harvey, Babcock and Wilcox, and volunteer Wilmer Rodriguez, L-28. Dwayne Martin, L-40, rolls a tube for a water-tight fit during the tube-rolling competition. 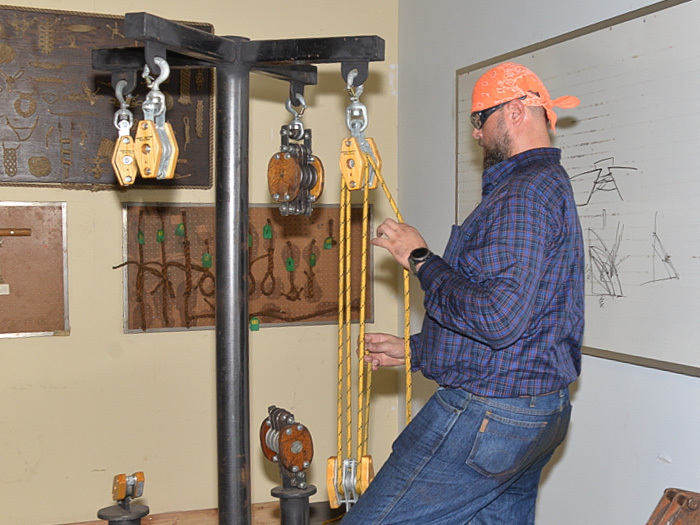 Local 83’s Michael Estes works through a reeving test. The Great Lakes team of Josh Slater, L-169, left, and Local 1’s Matt Stillson buddy up on the waterwall exercise. 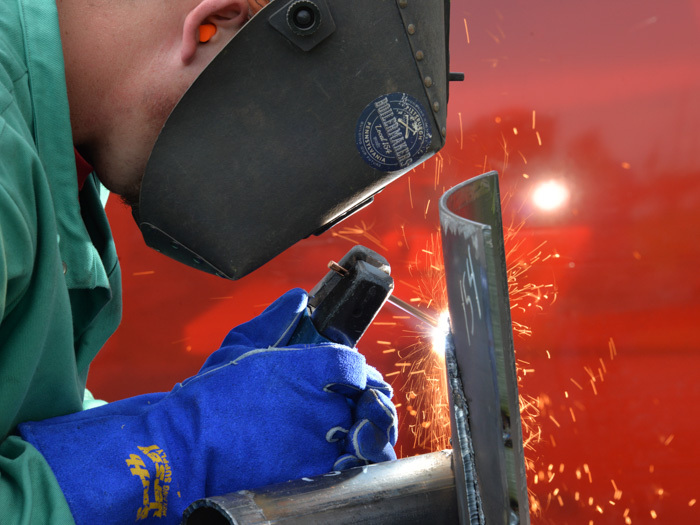 The test requires contestants to cut out a section of a bad tube and replace it with a new one. 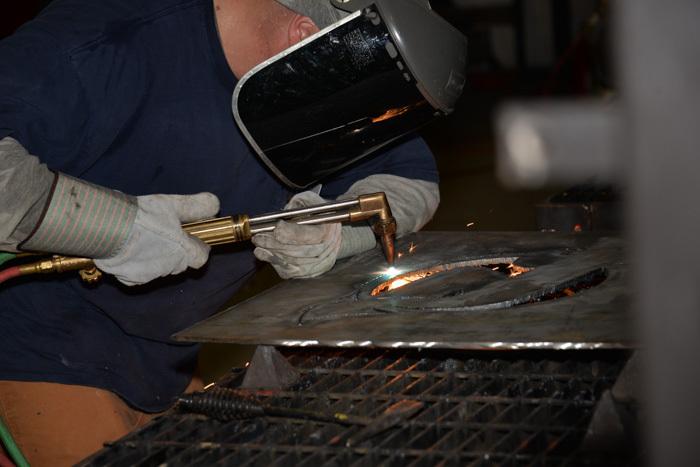 L-1’s Matt Stillson gouges the weld from a pipe and flat plate. 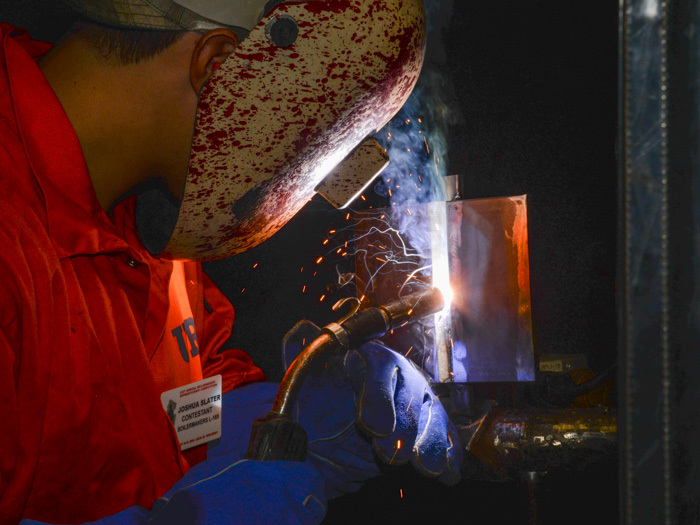 Contest winner Josh Slater, L-169, lays in a pass during the MIG welding exercise. 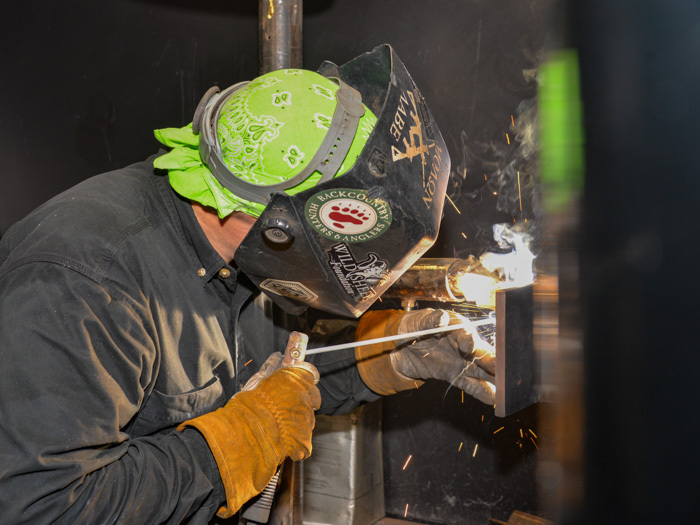 Slater, who kept the L-169 winning streak going, first heard about the Boilermakers through the High School Welding Invitational hosted by L-169 every spring. 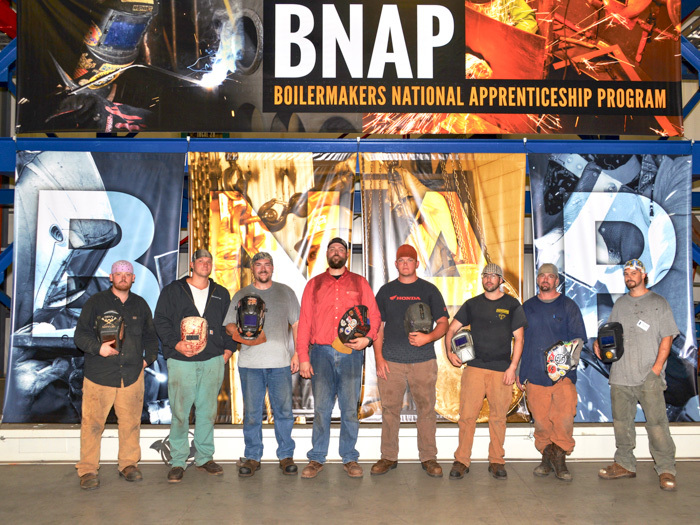 The program, which began 16 years ago, gives high school students early exposure to the Boilermakers and the quality apprenticeship training the union offers. 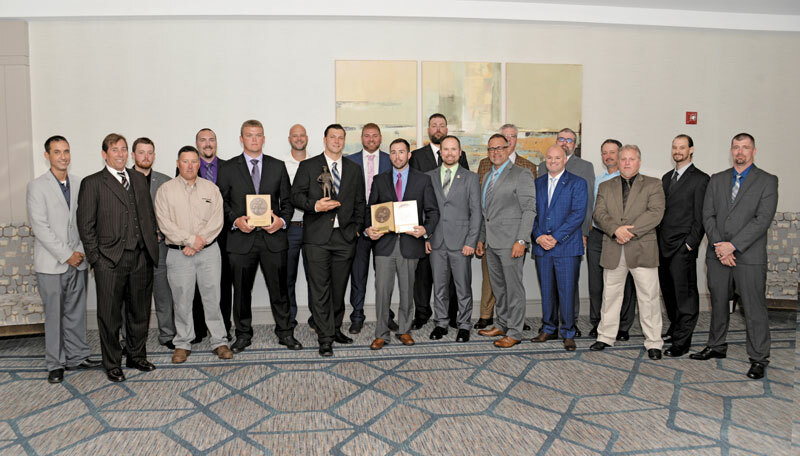 Also competing were Michael Estes, Local 83 (Kansas City, Missouri); Jason Eubanks, Local 549 (Pittsburg, California); Dwayne Martin, Local 40 (Elizabethtown, Kentucky); Matthew Stillson, Local 1 (Chicago); and Justin Williams, Local 101 (Denver). 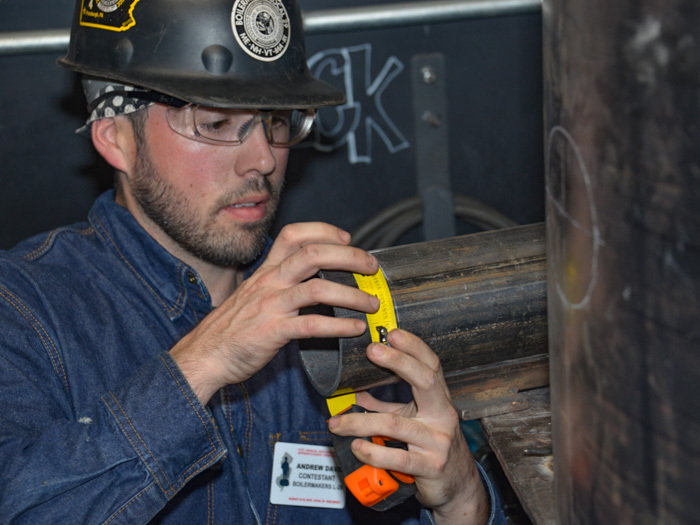 In addition to the hands-on competition, candidates competed on a written exam covering their four years of related studies and on-the-job-training, blueprint reading and safety. 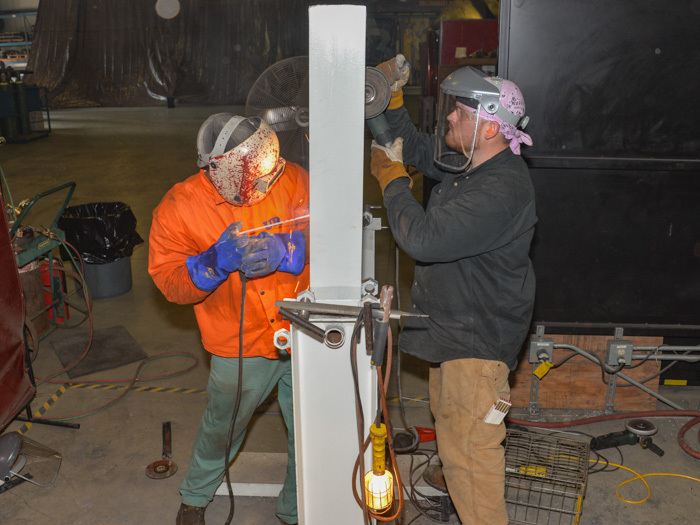 The hands-on portion included rigging, layout and fabrication, tube rolling, knot tying, hand signals, reeving, and equipment use, along with welding and cutting. Judges scored contestants on safety and on overall knowledge and demonstrated skills. 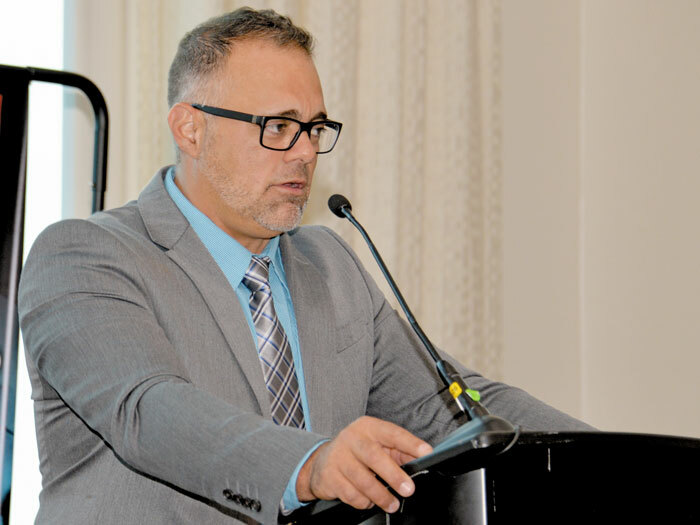 The lead judge for the competition was Michael Stanton (Local 154, Pittsburgh). Other judges for the event were Shon Almond, AD-NTDS; Craig Belfatto Jr., Shelby Mechanical; Monte Causey, IR-CSO; Jason Dupuis, NEAAC; Shaun Estes, Songer Corp.; Matthew Fink, Local 13 (Philadelphia); Chuck Harvey, Babcock & Wilcox Construction Co. Inc.; Jason Hettel, Local 27 (St. Louis); Collin Keisling, WSJAC; Travis Laine, Local 242 (Spokane, Washington); Larry McManamom Jr., GLABAP; Stephen Murphy, NEAAC; Eric Olson, SAJAC; BM-ST Chris O’Neill, Local 237 (East Hartford, Connecticut); Darrell Rosson, Graycor; and Gary Talmadge, CBI. The candidates were recognized and awards presented at a dinner. Presenters included International Vice President - Great Lakes Larry McManamon and Wertz, who also served as master of ceremonies.